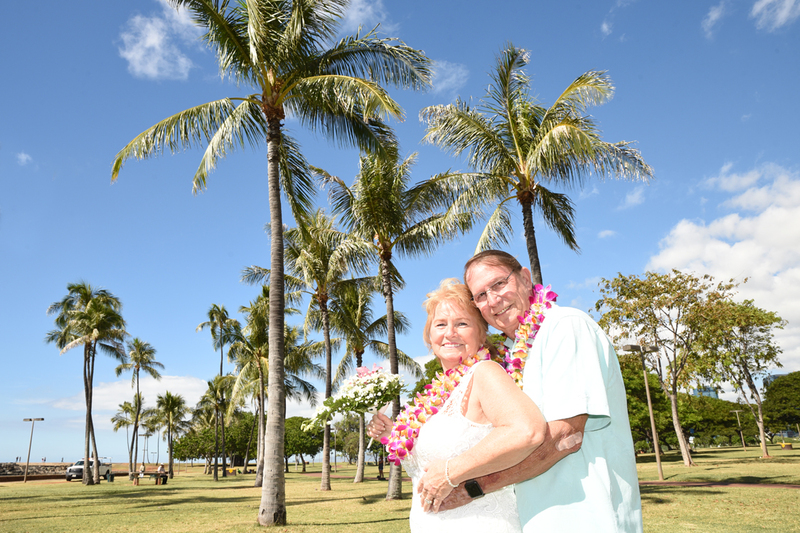 Great spot for honeymoon photos at Ala Moana Beach Park with Japanese couple Tatsuki & Asuka and Photographer Robert Hamilton. We may not have any snow, but we have beautiful Christmas decorations at the hotels in Waikiki. 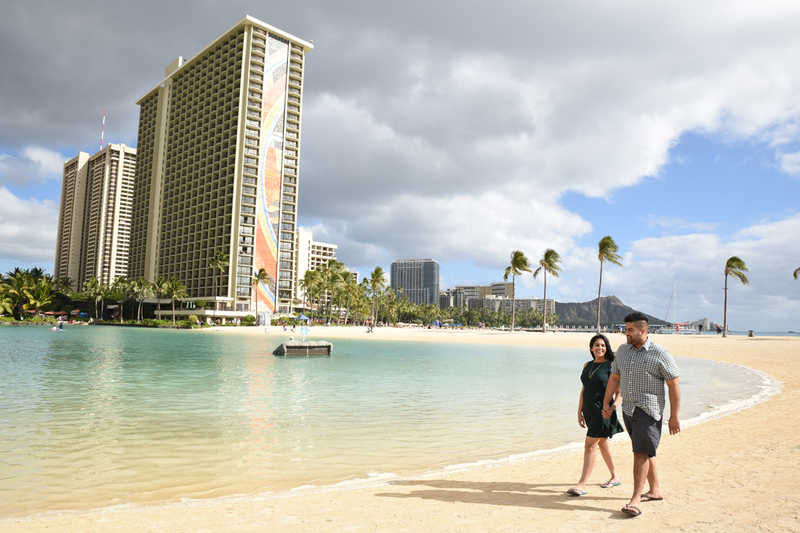 Leave the cold behind and enjoy a vacation in Hawaii! 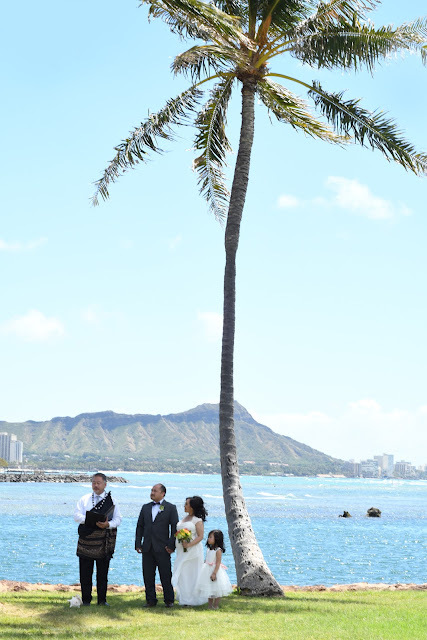 Awesome wedding photo with Sohei and Akiko in Honolulu Hawaii with a beautiful view of Diamond Head from Magic Island park. 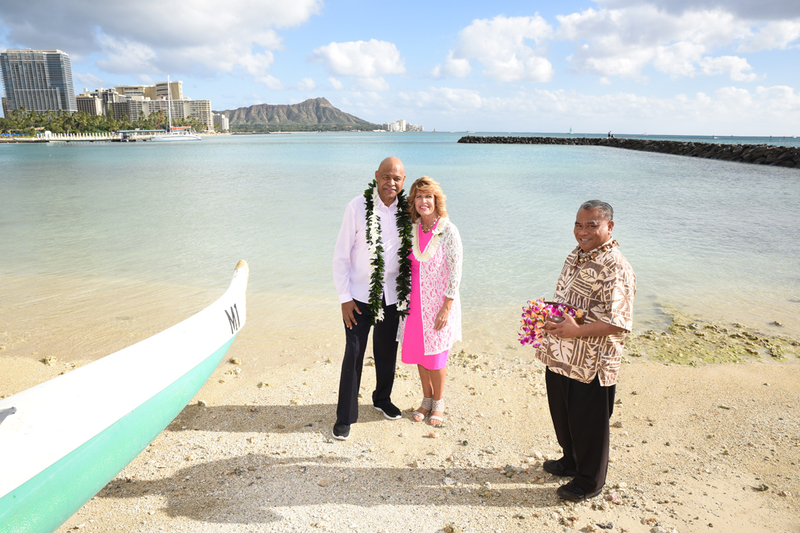 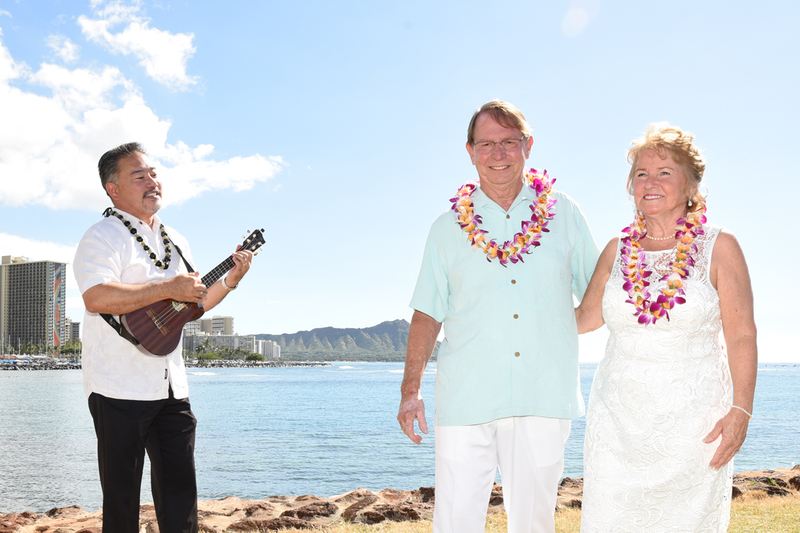 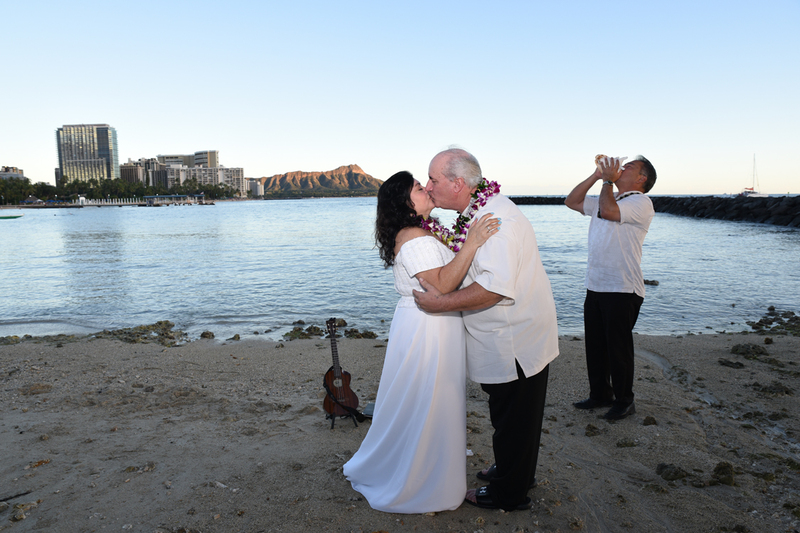 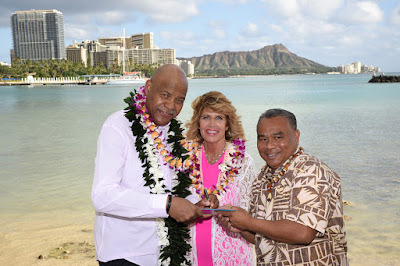 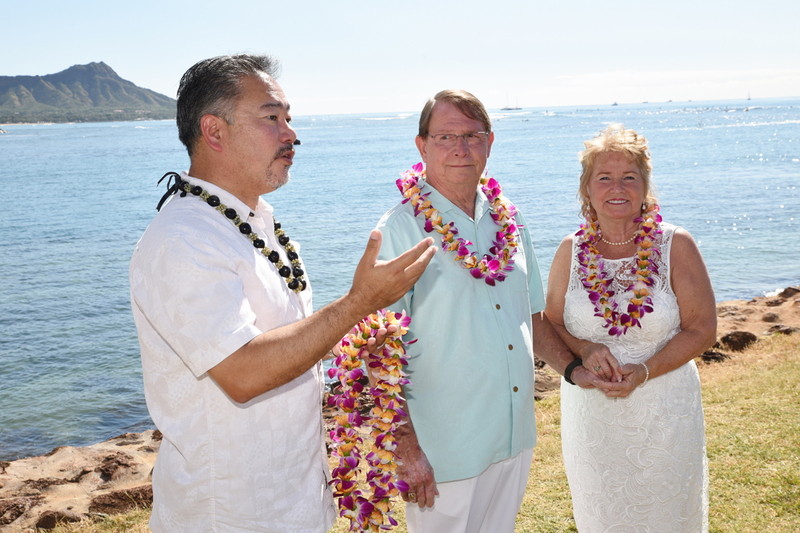 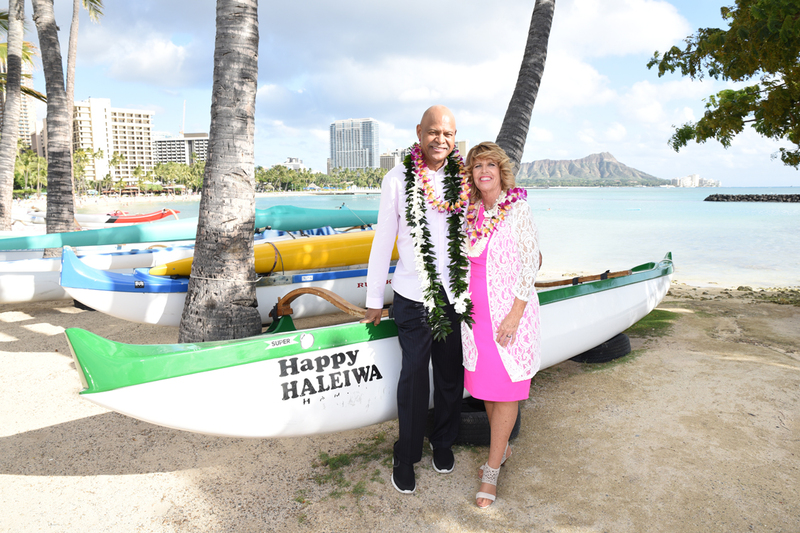 Rev John blows the conch shell as Vern and Mimi seal their Waikiki wedding with a kiss. 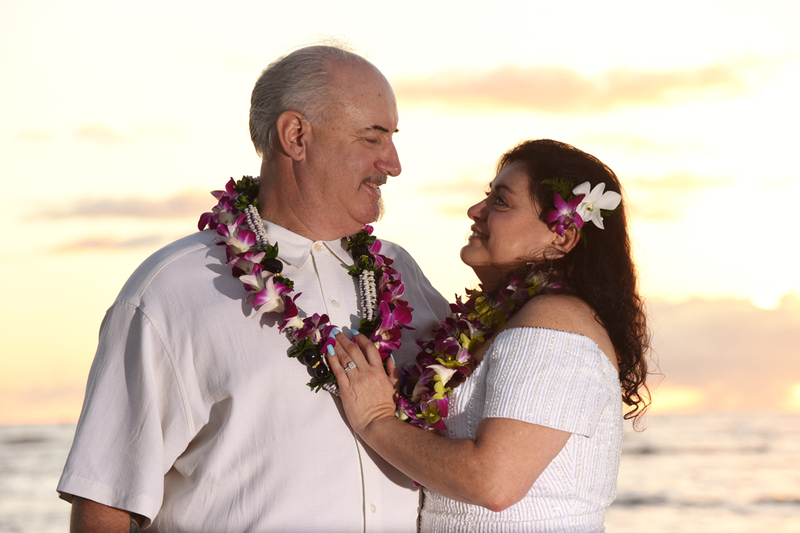 Lovely Honolulu sunset, beautiful way to finish the day! 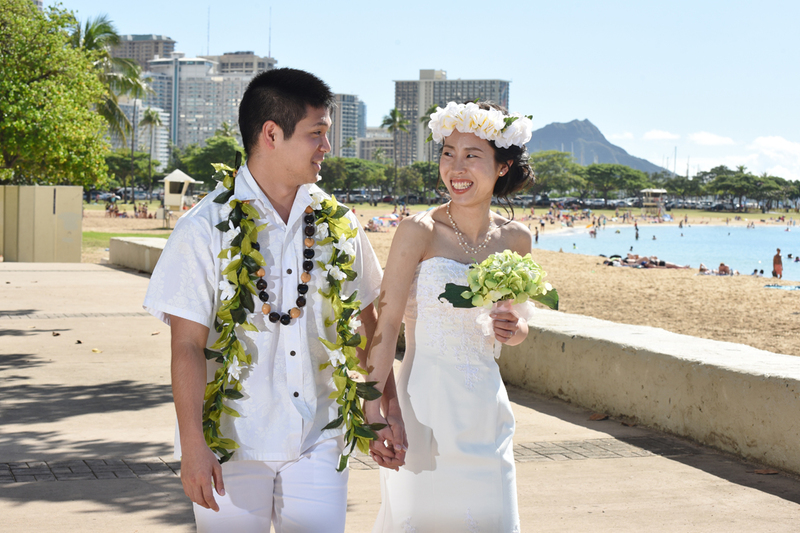 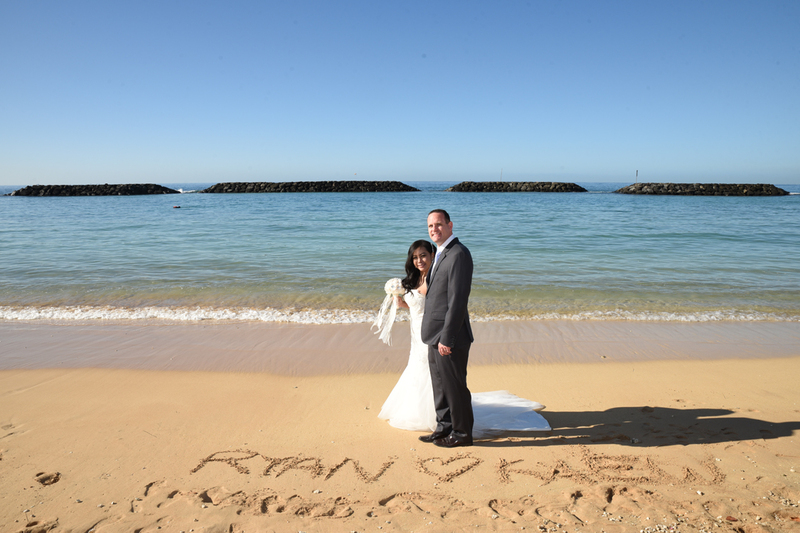 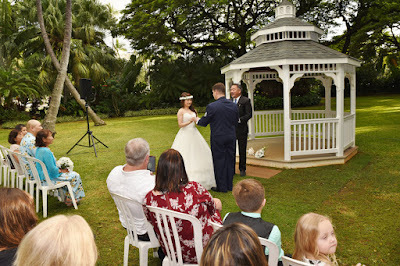 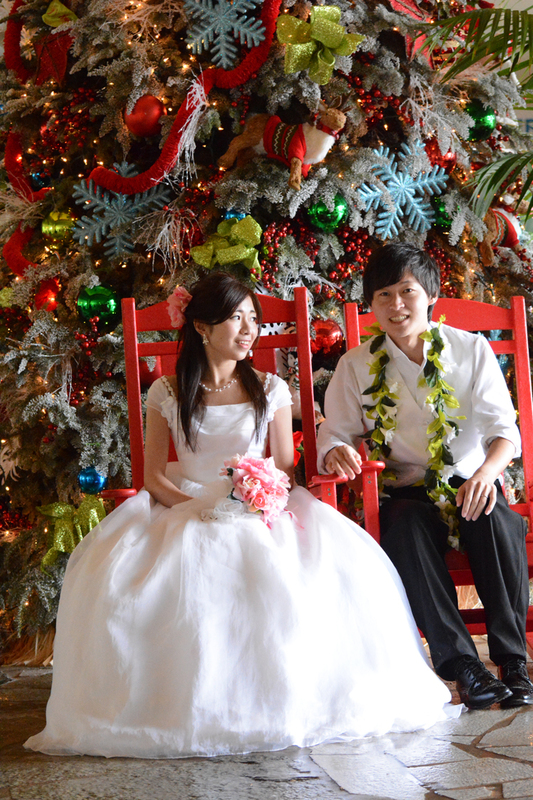 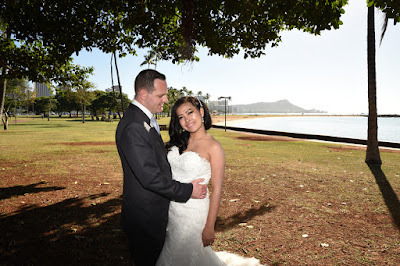 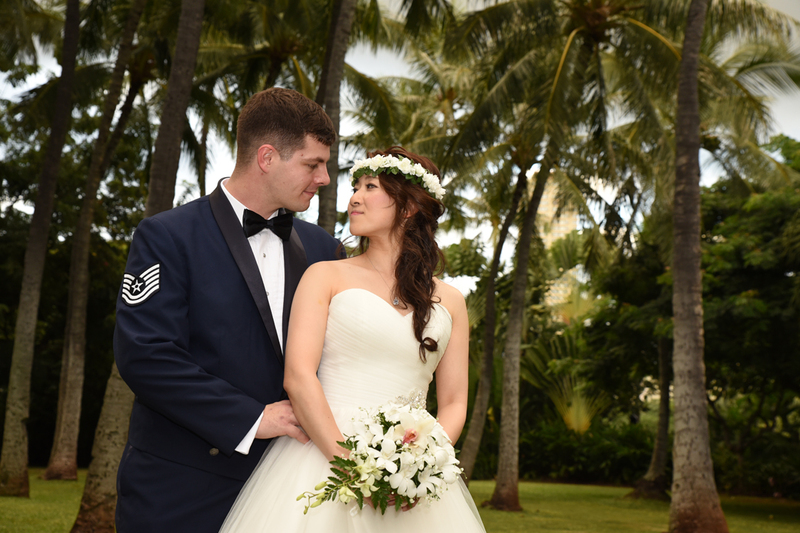 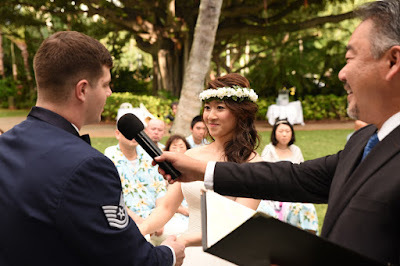 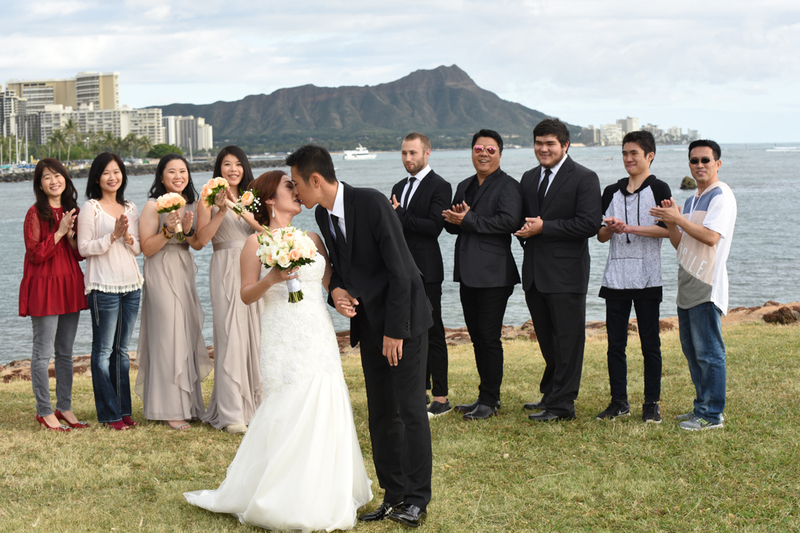 Getting married in Honolulu can be simple and easy with our Waikiki wedding package. 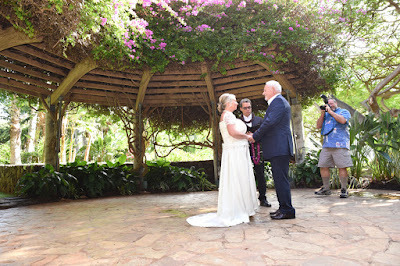 Our Officiant will sign your Marriage License after the ceremony, and Photographer Robert captures your special event on camera. Order your simple wedding package at 808-924-3600, Bridal Dream Hawaii. 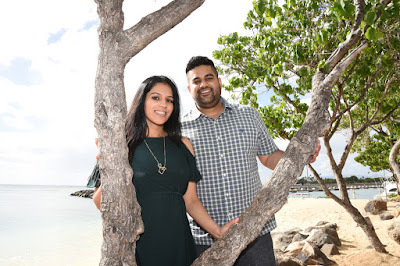 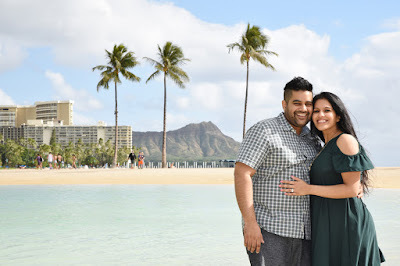 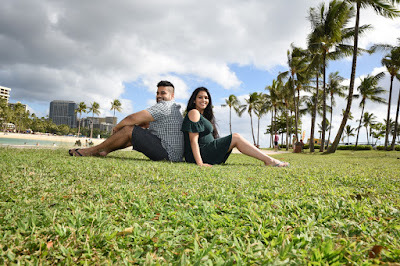 Our Oahu Photographer shoots Waikiki family photos as well as wedding photography, maternity, and honeymoon photos too! 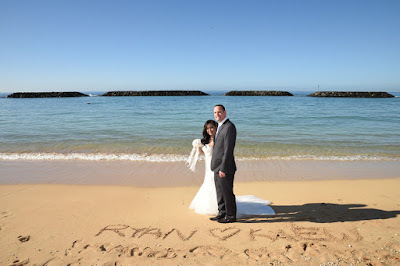 Max and Kelly give us a call for wedding photos at Magic Island and Dinner Reception photos following. 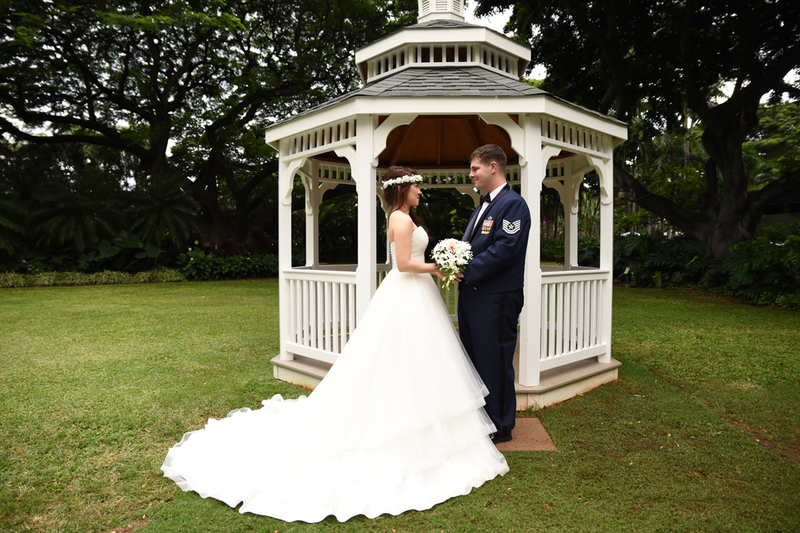 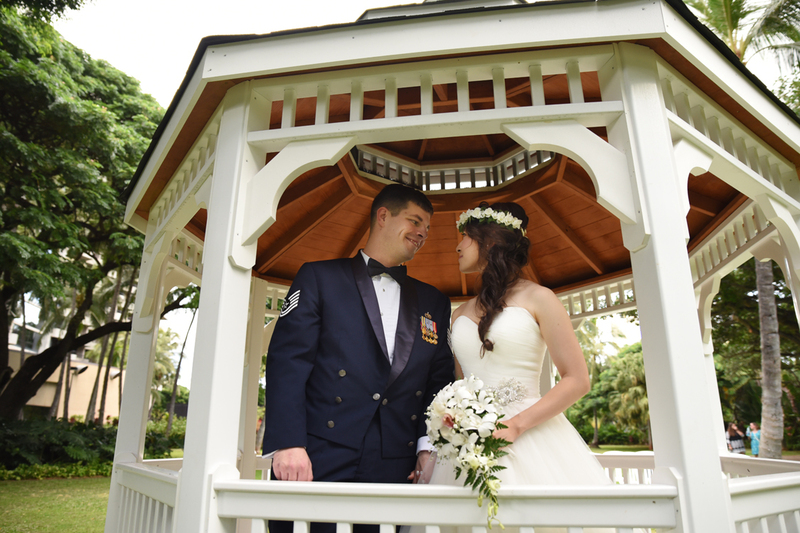 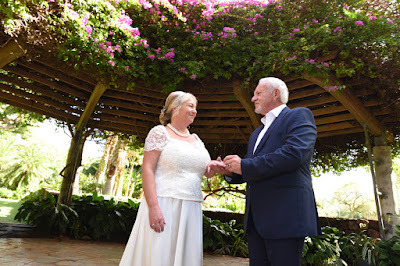 Maile Garden is a great wedding venue for active and retired Military, especially if you have 20 or more wedding guests attending. Purple orchid flower leis and beautiful Hawaiian Ukulele music give Mike and Kathy's Honolulu wedding a tropical feel. Their CAKE adds even more flavor! 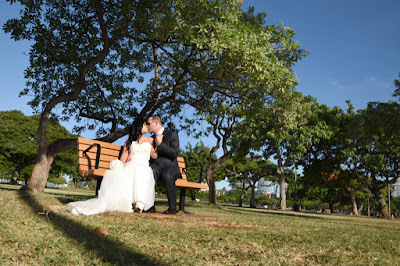 The trees and shadows make kind of a picture frame for Ryan and Kiew under the Banyan tree. Beautiful park scenery, and we don't have to pay any private venue fees. Photographer Robert shoots photos at Chris and Deborah's Hale Koa gazebo wedding. 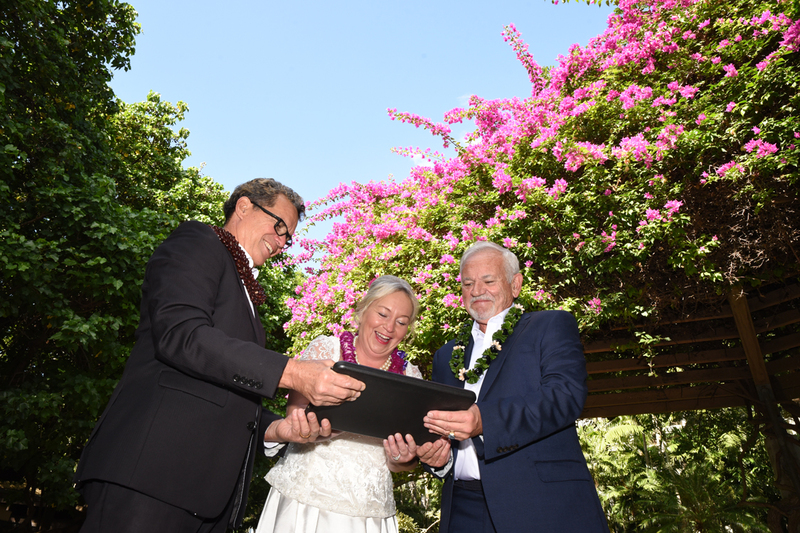 Beautiful pink bougainvillea makes an amazing backdrop for a Marriage License signing ceremony. 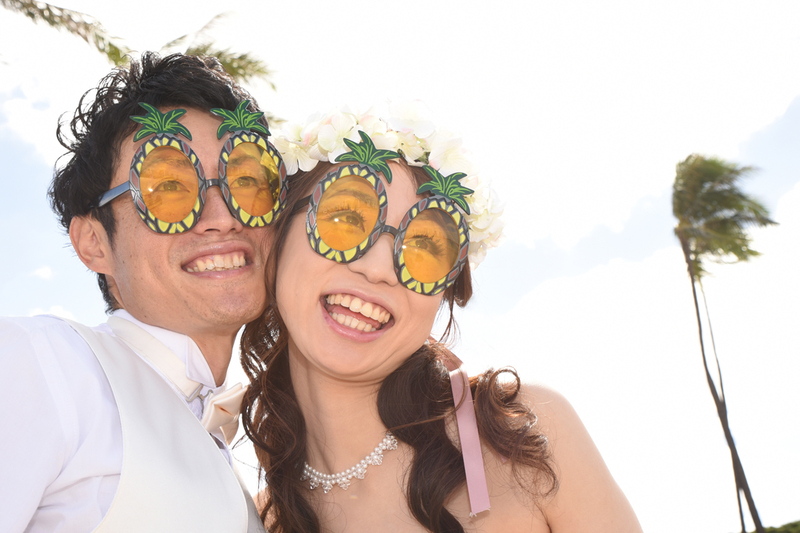 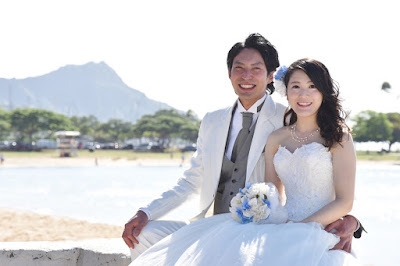 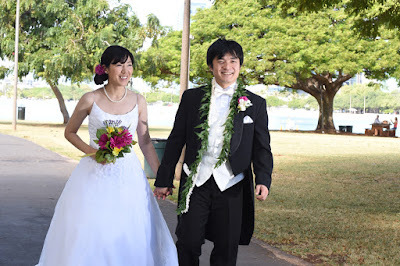 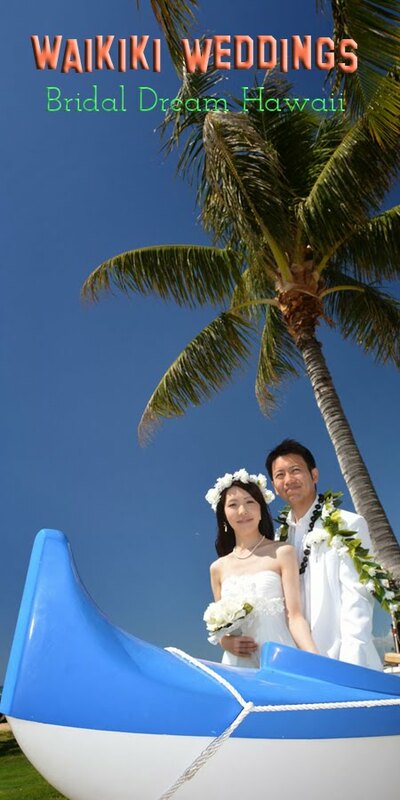 Cheerful wedding photos with Tsutomu and Akemi at Magic Island. 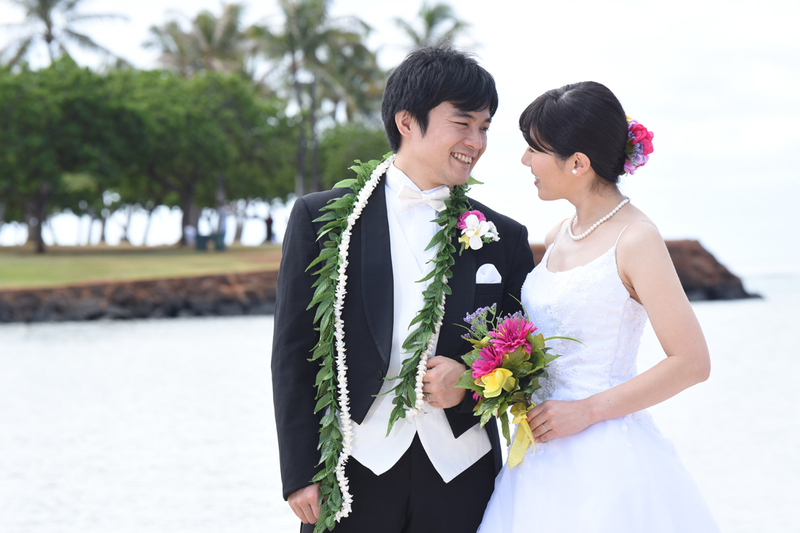 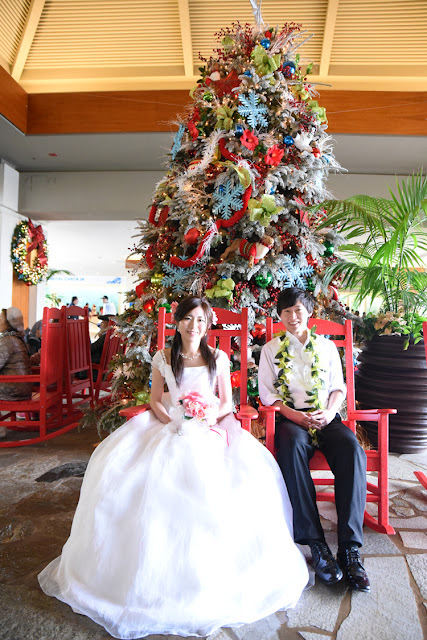 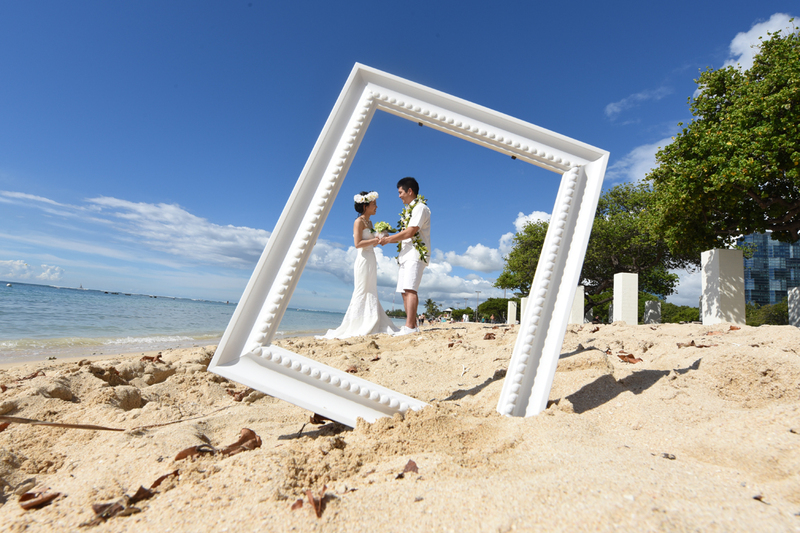 Beautiful shot on the white wall at Ala Moana Park, with Japanese honeymoon couple Masaaki and Mariko.